Zovirax is anti-viral medicine used to treat skin infections for cold sores and genital herpes (caused by herpes simplex virus types 1 and 2). Zovirax active ingredient aciclovir relieves pain and itching. 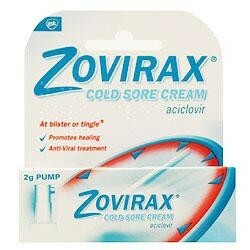 In most cases, if Zovirax is applied during the tingling stage the cold sore does not develop (like Abreva). If it is applied after blisters have formed, it shrinks the blisters almost overnight and relieves all the redness and irritation surrounding the sore. Aciclovir works by stopping the herpes simplex virus from reproducing and infecting more cells. In addition, it does not “dry out” the cold sores which many medications do; shrinking the blisters, but leaving a very hard scab that cracks and bleeds. The cream is most effective if treatment is started as soon as the first signs of the infection (a tingling sensation), begin to appear, though treatment can also be started after the blisters have appeared. The one down-side to using this medication is the cost. A 5 gram tube of Zovirax retails at about $120.00 and is subject to a higher co-pay with insurance because there is no generic equivalent available yet. Zovirax is also known to have many side effects ranging from mild to very severe such as swelling of your face, lips, tongue, or throat. Zovirax worked to subdue symptoms for both genital herpes and cold sores. It definitely helped decrease the duration and intensity of outbreaks. If possible side effects don’t scare you, we definitely recommend this product as one of the best prescription medicines. Zovirax works when I get an outbreak but I still get frequent outbreaks which is very disruptive to my life. It only works temporarily. I used the topical cream. I guess it worked but not as quickly as I or my physicians thought it would, not that impressed. Sticking with taking Lysine. I haven’t seen any outbreaks while taking this medication. Although I have experienced burning, stinging, and tenderness while taking acyclovir but I haven’t seen any blisters for about 4 months. I think my body is becoming immune to this medication.